Usually, I would not be singing the praises of anything cold. But, in my attempt to stay cool, I have resorted to imagery. Scrapping pictures of a snowy New Years Day has fooled me into thinking that it is NOT 106 degrees outside. Actually, it's not working, but it is cooler in my scrap dungeon than it is anywhere else around here. I'm using this hot spell as an excuse to scrap--not that I ever need one! 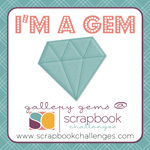 This page was inspired by Sketch 302 over at Scrapbook Challenges. I love sketches that allow me to use a pile of photos! Speaking of Scrapbook Challenges...my last posted layout (the "Grill Master") was chosen as a Gallery Gem! How exciting! My husband insists it was because the layout was one highlighting him---hmm! You can see it again HERE...and go check out the other gems too--SC is a fabulous, inspiring site!